I imagine that them announcing this and any potential demo at Retaisai is simply gauging interest, since in the past Aquasoft has released their games with I imagine a not inconsiderable amount of support and financial backing from the Play Doujin! platform. As it wouldn't be a option if they put anything on the switch, they'd have to seek a different investor. I can't help but wonder if they're already in talks with Nippon Ichi over that, as they've already partnered with the american branch in the past, and the company seems interested in having a presence on the switch. But again, I imagine it's only talks and interest gauging right now, and it's entirely possible they won't go anywhere. To call this an announcement is going too far and I think the MNN writer overstepped. The three main points of the tweet are "the Switch hardware is very interesting and I wanted to see a FushiGen at-home and on-the-go"; "Because I only just started tinkering for inspection purposes please note there might not be a test display at Reitaisai"; and the last line is "Everything from here on is undecided / we have no plans", for cripes' sake. This is absolutely not an announcement of anything besides that they seem to have a dev kit. Nice to have that cleared up. I only found out about this news recently and I'm just currently in disbelief that it would be this quick for PlayDoujin to suddenly go off onto another system after this deal that seems pretty exclusive with Sony. I will say though with how the Vita is somewhat on the way out among the Switch currently doing well I would probably expect that the Switch might be an option but there has to be way more legal stuff to go through to ensure that this doesn't breach anything with Sony or the PlayDoujin stuff as well. It'd be cool to see but right now it's too soon. (Also as an owner of of a PS4, Vita and Switch I feel this isn't too detrimental for me though I wouldn't mind seeing Switch ports since my Vita currently has some nasty scratches on it). I actually had a chance to ask D.N.A. about this and it seems like PlayDoujin isn't a Sony-exclusive publisher or anything, they were just the easiest ones to work with. If a Switch version can be made, it seems likely to go through. Having a fangame for the Switch is now a reality. Well Lumia reminds me of luminescence which is another word for moonlight which many of her attacks have moon in them. Darkness Sign "Dark Side of the Moon"
It's also worth noting that Lumia and Frandoll are the only two windows touhou characters we never got English names by ZUN for (because they never came back and EoSD didn't have the English names in it), so its kinda hard to actually see what he intended them to be. I have only seen claims on Twitter so no hard evidence but allegedly, due to Scarlet Curiosity sales not living up to expectation, XSEED quits localising any more Touhou fangames. People there also say that XSEED didn't even try to promote or advertise the game so that's why not many people know that it exists and buy it. XSEED interviews about Scarlet Curiosity and other games. 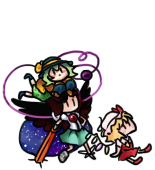 EDIT: Currently at NeoGAF, there is an extremely heated debate whether ZUN is selfish for not localizing official Touhou games. I hate this fandom sometimes. I don't have a link handy, but I recall that ZUN is on interview-record as saying that he would continue making games even if no one bought them anymore. Looks like a fair number of people in that thread are trying to apply common/Western game dev economic standards to ZUN and Touhou when they're not congruous at all. That thread is also being fairly cruel to the localized fangames. Bullet Ballet was rather clunky and unimpressive (visuals aside) but I absolutely love the Gensou Wanderer/Double Focus combo. Both are fantastic games in their own right. God this is why I've been trying to promote this game as much as possible! Out of many of the fangames its the easiest for a newcomer to get into as it's not full of touhou memes and is decently close to the actual story without changing a characters personality (Only one story issue is that people wont know who they are, and people wont get why the story doesn't have major importance). I might actually make a point of this in my review now that my LP is done. There is so much people don't understand about this game so they misjudge it because of other fangames. Sorry that makes me mad that they wont give us the numbers for sales and just say "it didn't do as well as we hoped". Plus wow the hate for touhou games in that place. Its like these people don't understand how huge getting publishers to do anything with touhou. I need to make notes for these to better explain it to others. Xseed really don't have to give up... how about publish some games people would be excited for, like puppet dance performance or Koumajou Densetsu. Now I'm not sure who I'm more disappointed in, Xseed or NSIA, at least NSIA is still selling them. Agreed, they don't seem to know ZUN that well sadly. BB was fun except for its broken multiplayer but GW/DF is actually a lot of fun and my favorite of the ones NSIA has released so far. Publishers likely cannot give sales data in the granularity that you'd like to hear, tbh. There's a reason you only hear very vague statements as to how much X or Y sells, like "oh, it's over a million shipped! [aggregated over all SKUs so we don't have to say how many of each actually sold]"
It's not nearly as simple as people like to make it out to be. You can't just Localize It And They Will Buy. Marketing is huge and costly and expensive and absolutely mandatory for modern sales of any sort, up to and including putting stuff on Steam. Really, though, we've been having this argument since the dawn of Touhou's western fandom though and it's as pointless now as it was then. ZUN's entitled to do what he likes. People are allowed to think of it what they like. If he feels like putting the games up, he will. *sigh Yeah... the funny thing about marketing is they could have at least tried a bit, did more youtube stuff. I actually got a few of my viewers to buy the game which made me very happy! Feels like I did my job right! As long as these games keep coming out in the JPN store at least I'll still play them. Why spend time, effort, money, and whatever else it takes to "localize" your game when the fans are more than happy to do it themselves? Unlike some developers/publishers/etc ZUN doesn't encrypt the assets of his games. The official games all get translated to multiple languages by the community and it's not very difficult to purchase brand-new copies of them from Amazon at relatively low prices. All in all it seems like a lot of people in that thread are just complaining for the sake of complaining. So move along, let them act all entitled and all, and don't let them ruin the experience for you. eh most people in the thread are on the side that ZUN can do whatever he wants. My personal opinion is that it's "justified selfishness;" he doesn't localize or otherwise cater to the western fanbase simply because he'd rather make games. There's nothing wrong with that. there's probably a better word to use than "selfishness" but I can't think of one right now. i don't think the games would even sell enough for anyone to bother trying to localize/translate them. i mean the playism release of DDC was as utterly barebones as you get in terms of cost (literally all they had to do was put out a tweet and a storefront page) and they still never bothered following up with any of the prior games or LoLK, or any fangames, or even so much as a blog post. i don't know if it was because of the backlash due to lack of translation, a disagreement with ZUN, or what, but that was probably the best hope the games had of continued "official" releases and the fact there's been complete radio silence from playism on that front for two years almost now kind of leaves the hope of any further official release via western channels, much less localization to be utterly torpedoed. As for the fangame front - it seems they're finding something of a home via this, but I can't help but wonder why, given how poor the choices for localization and the sales from what we've heard have been. No idea how NISA's doing, but I don't rightfully think we'll know until after burst battle comes out - they probably got enough data from their release of genso wanderer and double focus that we'll know if they have any intent of keeping this up then. hopefully they bring tod reloaded over at least, that'd be nice. this is kind of a super negative post but there's probably still hope on the fangame front. their advertising costs are probably really low, NISA is making a bigger push to raise awareness of them than XSEED did, and there's clearly a bet on NISA's end to try and leverage the usual willingness of niche audiences to pay more for a specific product that might pay off and make them, if not terribly profitable, at least a decent profit. but again, we should know for certain if it's worth their time after burst battle comes out and we see what their plans (if any) are with fangames from there. Also, why aren't there any announcement for more games distributed on either Playism or Play,Doujin? It's really been a while since the former's last game, which is Marisa and Alice's Trap Power back in December. Playism even made a poll long time ago about which game to distribute but nothing ever came to light. Who the hell needs a bloody signature of all things? As a Touhou Project Fan and Supporter I share your disappointment...I beg your forgiveness but TFW stand for which TH Game? However it is also ,if not more,important to share this reminder http://www.nisamerica.com/games/touhou-kobuto-v/ along with this sorta-update - ABOVE AVERAGE but it still need Patche(s) - https://www.google.it/search?q=touhou+kobuto+v+burst+battle+review&ie=UTF-8&oe=UTF-8&hl=en-it&client=safari#lbl=REVIEWS&pie=plaji-i . By the way,regarding TH and TH- like generic ongoing and potentialon PSV(ita) and Its ratio with the PS4 but also the overall hand-held situation and potential,BOTH official (Sony and Contracted Third-Parties )AND unofficial PSV involvement sales , support , sharimg have been turning more and more niche for a fairly long while and in a mostly-unprepared way; no real sign or effort had or has been made for a Turnabout and more Resources and Lime-Light is and is going to be on the PS4 and the next-to-be PS5. I beg your forgiveness but TFW stand for which TH Game? TFW usually stands for "that feel/feeling when", so they were just expressing disappointment for lack of those pretty much.